I read “The Dishonest Mailmen” and identified with it immediately for reasons I didn’t understand, and indeed for reasons that specifically elude understanding. In its fifty-some words, it conjured equal measures of anger, tenderness, and apathy, an intoxicating combination … “for a student,” I almost wrote, but what I mean is for anyone. Still, there’s something in that couplet—“I see the flames, etc. / But do not care, etc.”—that remains to me the most profound evocation of a heart-heavy nihilism that seems to afflict people exclusively in their late teens. Mainly, let’s be honest, it afflicts white guys studying literature in their late teens, who don’t know what to do with themselves or how to talk to people or how to live unselfishly, and who are able to voice this not-knowing with increasing, brooding eloquence, and who are thus infuriating to themselves and others. 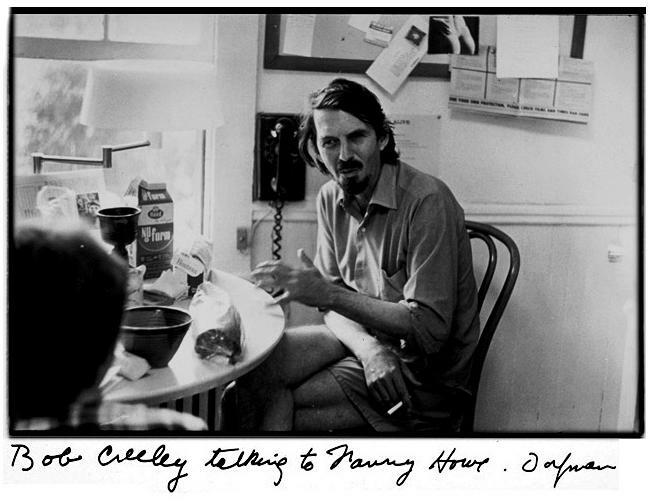 In Creeley’s poem, the offhandedness of that “etc.,” which appears three times, is a more compact whatever than whatever itself—more effective than an eye-roll or the lassitude in a plume of cigarette smoke. It summons all the disaffection and paranoia of any undergrad ever to loiter on the steps of some hallowed hall on some hallowed campus in some hallowed college town. “I don’t care, etc.”: exactly. It’s all that punk-rock acedia without the sneering. It’s a fact. It is, just as it says it is, “The poem supreme, addressed to emptiness.” When you’re nineteen, someone is always taking all your letters and putting them in the fire. But, again, wait, hell, it’s not just when you’re nineteen—we’re all encountering dishonest mailmen every year of our lives. We try to communicate and fail. We see the flames, etc. I would be very much cheered to realize that someone had felt what I had been feeling in writing—I would be very much reassured that someone had felt with me in that writing. Yet this can’t be the context of my own writing. Later I may have horrible doubts indeed as to whether it will ever be read by other persons, but it can never enter importantly into my writing. So I cannot say that communication in the sense of “telling someone” is what I’m engaged with. In writing I’m telling something to myself, curiously, that I didn’t have the knowing of previously … I write what I don’t know. Communication is a word one would have to spend much time defining. For example, can you make a blind man see? That has always been a question in my own mind. And if it is true that you cannot tell someone something he has no experience of, then the act of reading is that one is reading with someone. I feel when people read my poems most sympathetically, they are reading with me. So communication is mutual feeling with someone, not a didactic process of information. That’s precisely what’s on offer in “The Dishonest Mailmen”: a mutual feeling of something neither the poet nor his reader knows. They are taking all my letters, and they put them into a fire.